Stilted [stil-tid]: Stiffly dignified or formal. Hmmm. 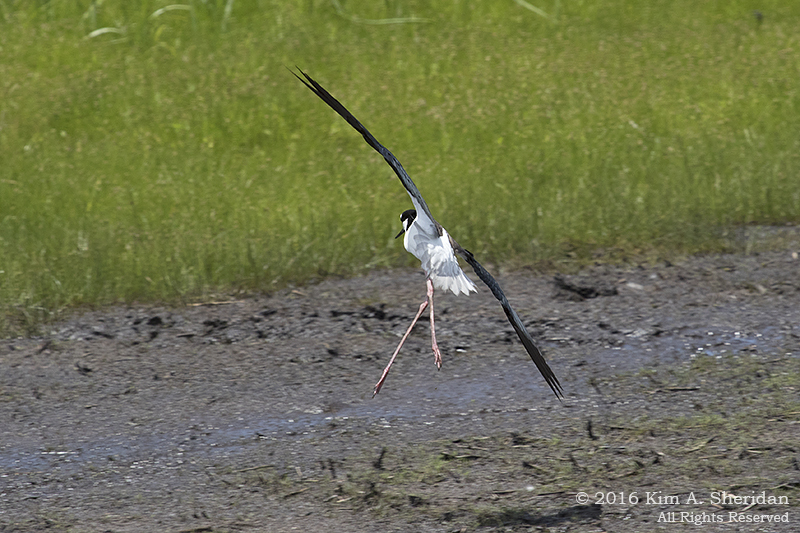 Ok, this bird could be described as “dignified or formal.” This is a Black-necked Stilt, a slender shorebird with long red legs. In his black and white attire, he seems ready for a formal affair. I coaxed my friend Don into a trip to Bombay Hook National Wildlife Refuge along Delaware Bay in Delaware on my birthday a few weeks ago. I’m not sure what I was hoping to see. Ospreys, Harriers, Egrets. American Avocets, if we were lucky. Foxes, maybe. 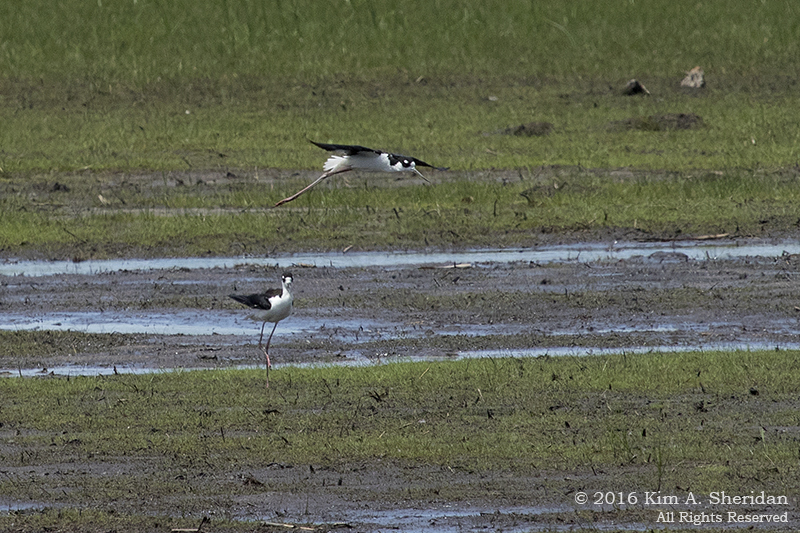 We weren’t expecting Black-necked Stilts. And we certainly weren’t expecting to see the behaviour we witnessed. 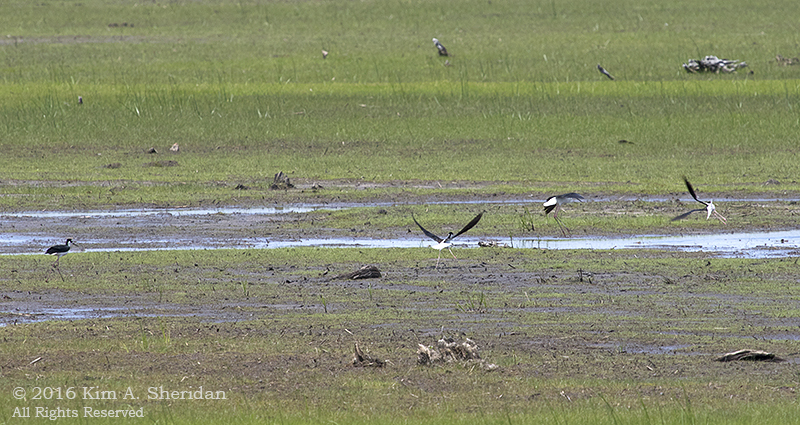 I’ve only seen Black-necked Stilts at this Refuge, and only a couple of times. 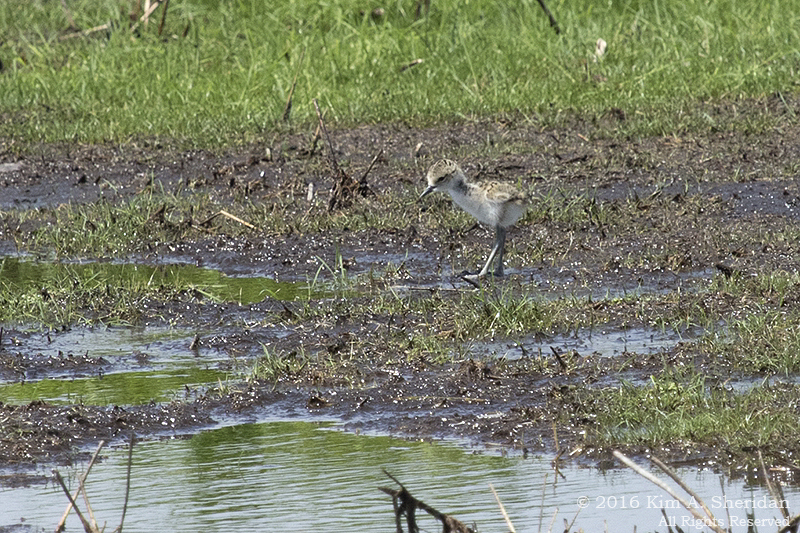 Always it’s been one or two birds, far across the impoundments, difficult to see and impossible to photograph. Yet, here they were, Stilts close enough to the Wildlife Drive to see and photograph. We were thrilled to watch these elegant and formal birds. “Stiff” is not a word that describes the Stilt, though. On land they tip forward on those long legs to forage for invertebrates and small fish, then agilely twist to groom themselves. In flight they are graceful and airy. A little further down the road, we found more Stilts, and things began to get interesting. Two pairs of birds were flying in a looping, elaborate aerial dance. A dance it was indeed, as these couples were clearly engaging in a courtship display. Turning and wheeling with long legs dangling, they put in mind ballet dancers in tuxedos leaping across a stage. We also witnessed another pair mating. 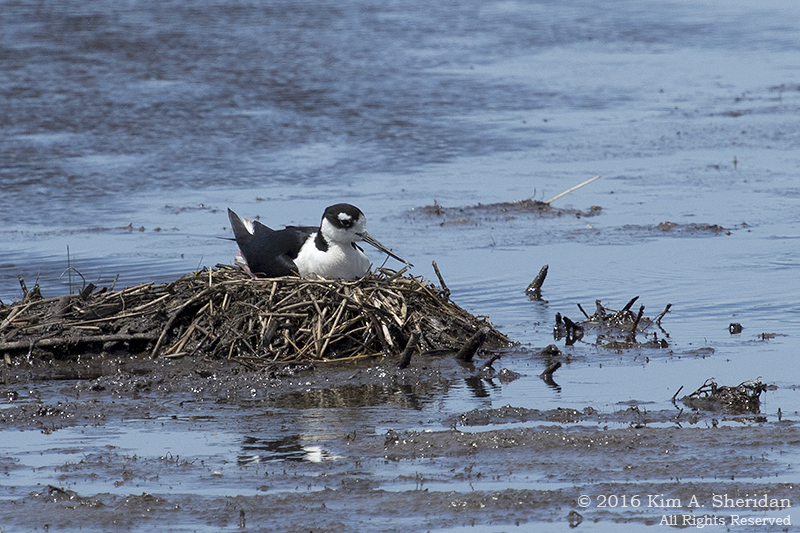 Yet another Stilt, sitting on a nest, incubating eggs. 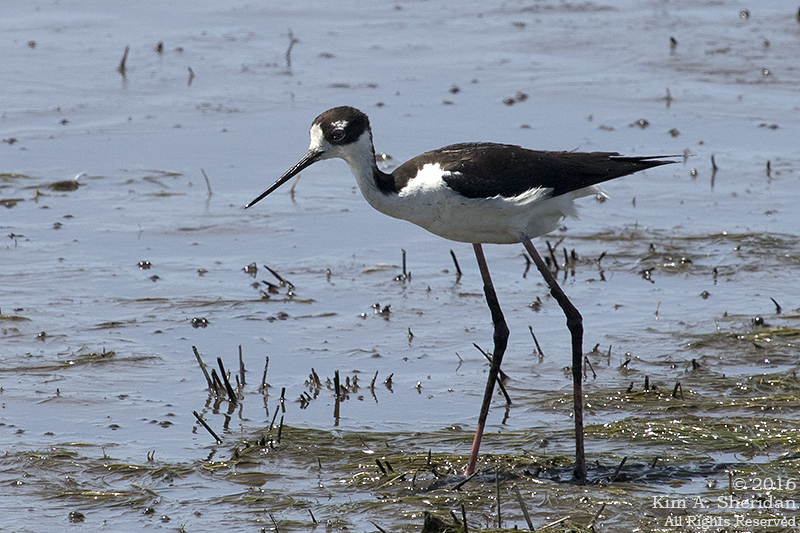 Stilt nests are scrapes in soft ground. Often they are on small islands surrounded by shallow water. In the course of a few hours, we saw the entire range of breeding behavior, from courtship display to mating to nesting. 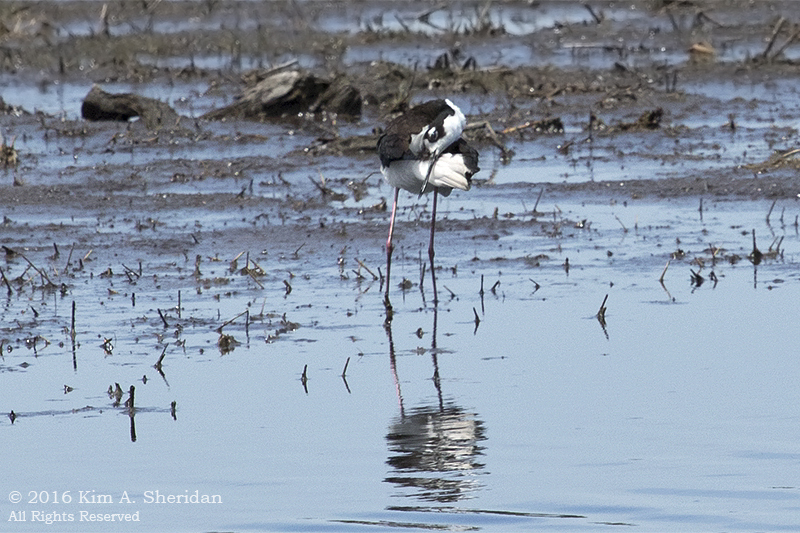 We felt lucky to get this little glimpse into the lives of Black-necked Stilts. But wait. If there’s a nest so easily viewed from the road, might there be babies to see in the future? 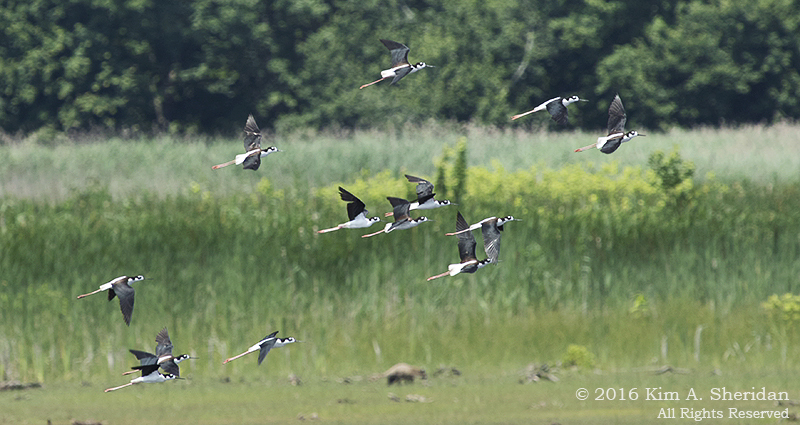 Two weeks later Don and I found ourselves back at Bombay Hook, hoping to see Black-necked Stilt chicks. We weren’t disappointed! 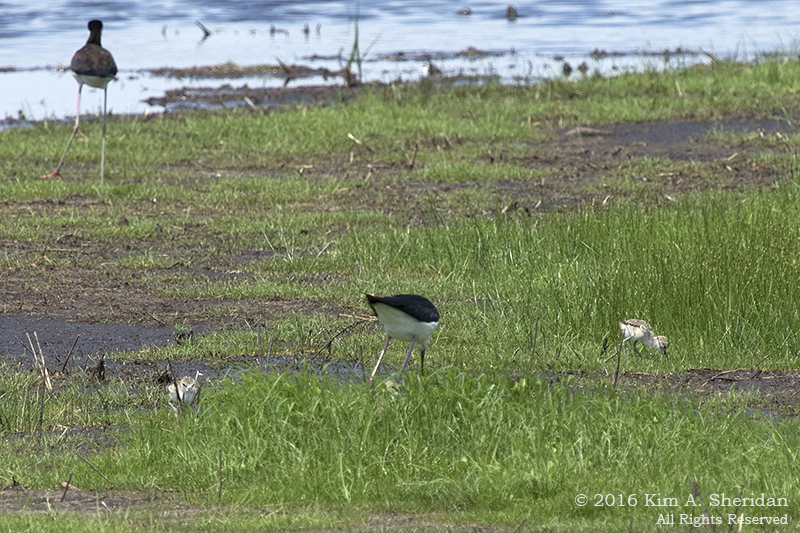 We found the Stilt family on a low island of green grasses in one of the Refuge’s pools. Two adults, and three chicks. They are all visible in this photograph, although you have to look hard for the third chick. 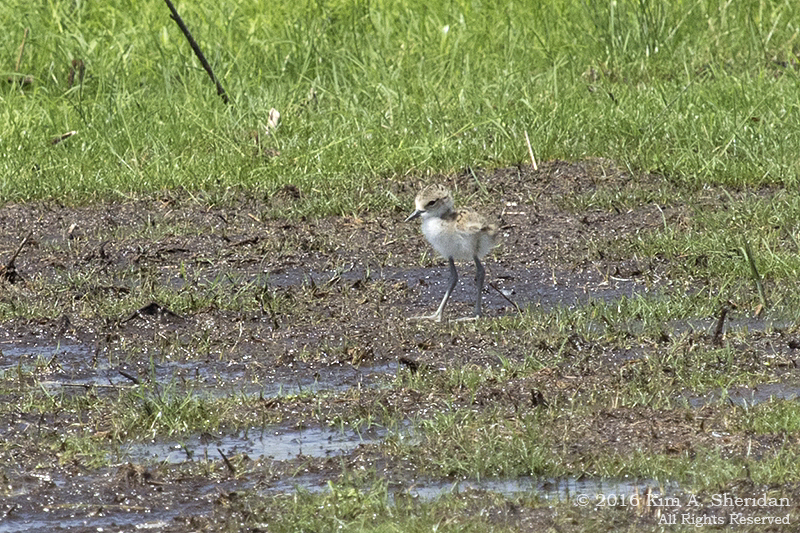 Its head is barely visible just in front of the right-hand adult’s feet, nearly lost in the green grass. Cuteness Alert! This little ball of fluff is irresistible. A pom-pom on two long slender sticks. Stepping out. 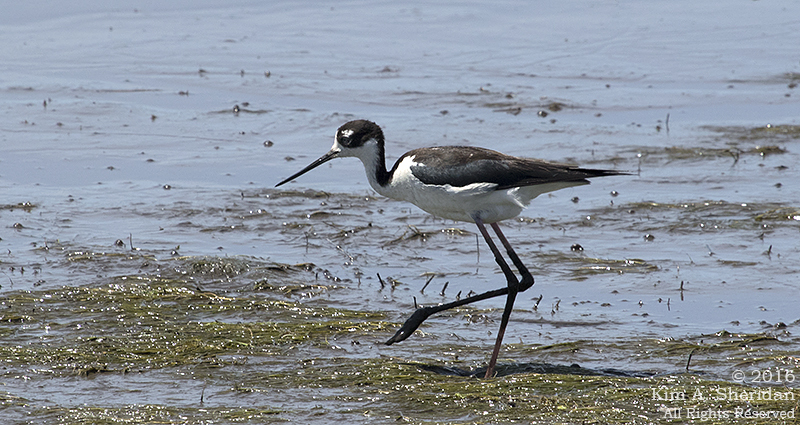 Stilt chicks are able to walk and forage on their own with hours of hatching. It will be some time before they grow feathers and learn to fly, though. Until then, this tiny island is their entire world. Their parents are vigilant, constantly on guard for any possible threat. Like a Great Egret that landed too close for the Stilts’ comfort. One parent took several passes at the Egret. When it moved even closer, the Stilt had seen enough, and aggressively chased the intruder away. Never underestimate the smaller bird if it has chicks to protect. 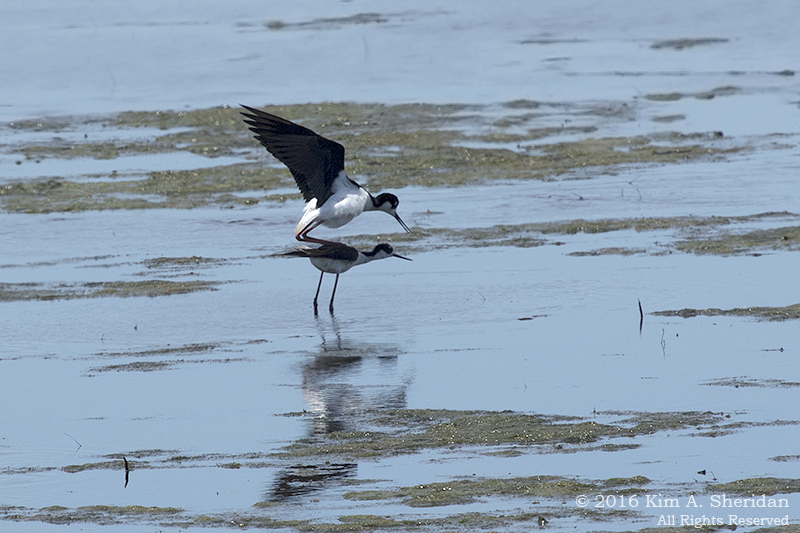 Don and I had thought ourselves lucky to witness the breeding behavior of Black-necked Stilts. We felt positively privileged to spend time with the adorable fluffy offspring of these elegant and distinguished birds. 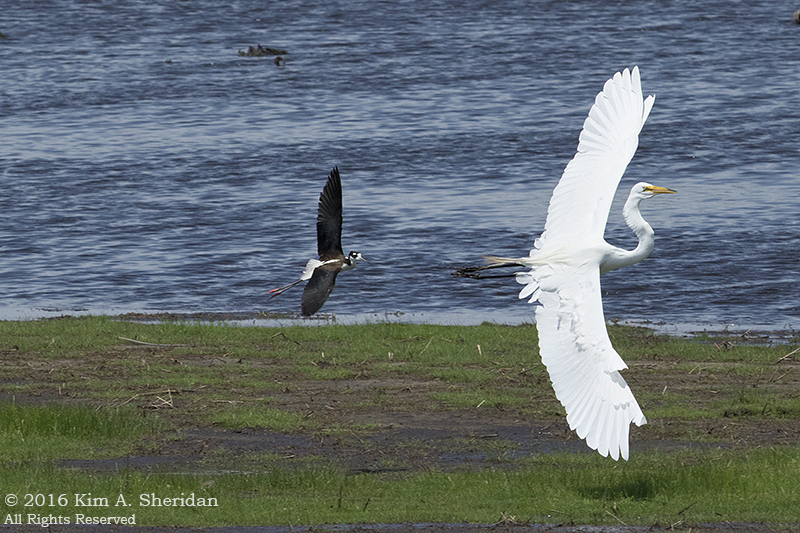 This entry was posted in Birds, Nature and tagged Birds, Bombay Hook NWR, Nature by Kim. Bookmark the permalink.